The UA Phoenix Mars Lander continues to stack up the accolades. Last night's episode of Nova on PBS, highlighted the mission's role in the search for life on Mars. Now Discover magazine ranks the story "Phoenix Lander Strikes Ice on Mars" as #6 in their year end list of the top 100 stories for 2008. 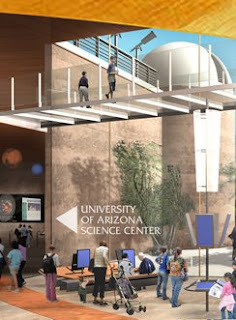 Will construction start on the UA Science Center in 2009? With the end of 2008 just a couple hours away, one of the questions is whether we'll see construction start in 2009 for the University of Arizona's new $130 million Science Center in the Rio Nuevo development. The UA Mineral Museum, now housed in the basement of the UA Flandrau Center, will move to the new facility when it's done in 2011. Fingers crossed. 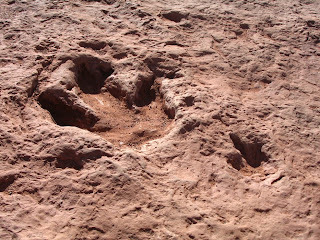 The East Valley Tribune (Phoenix) newspaper posted a video showing a dinosaur trackway, skeleton, and, according to the guide who is filmed, some huge coprolites. There is no label on the video, no idea of who shot it, or where it came from. But it sure looked like it might be somewhere on Arizona's Colorado Plateau. I sent the link to Steve Semken, geology prof at ASU who's worked that area, and he confirmed that the tracksite is on Navajo land just off highway 160, a couple of miles west-southwest of Tuba City. It's moderately well-known among the geologic community but there's not wide public recognition or promotion of the site. There's a good description of the site, how to get there, and what to look for at the Hike Arizona site. The Phoenix Mars Lander Twitter contest was the 9th most popular story for Wired magazine in 2008. The Dow Jones U.S. Mining Index fell 49% in 2008 compared to a 40% drop for the Dow Jones Total Market index and 39% for Standard & Poor's 500 index, according to Business Week. They also highlighted Phoenix-based Freeport-McMoRan Copper & Gold Inc., which had a 77% drop in value of their stock. 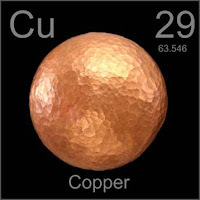 Much of that has to be from copper's fall from over $4 earlier this year to $1.28 today. Ouch. There's a new compilation of 100 Earth science blogs posted online, including quite a few I haven't seen before. The definition of Earth science here includes meteorology and climatology so it's broader than many. The list is sorted into categories such as geology, paleontology, volcanology, geo-hazards, mineralogy, and planetary science. I'm scheduled to talk live with host Ira Flatow [right] on NPR's Science Friday this Friday, Jan. 2 at 12 noon local (MST) time (2pm EST) about celebrating 2009 as a Year of Science. 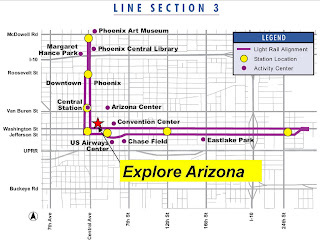 Arizona's new light rail stops just a few feet from the AZGS-BLM "Explore Arizona" map/bookstore and outdoor information center in downtown Phoenix. Get off at either Jefferson/1st St. or Washington/3rd St. "Explore Arizona" is on 1st St., just north of Washington. Hours are 9am - 6pm, M-F. The store carries a full range of AZGS and AZ Geological Society publications, plus reports from a large number of other state and federal agencies. We have official USGS topo maps for all of Arizona but most are stored offsite, so it's best to call ahead 602-417-9300. At the base of the Chiricahua Mountains, near the town of Portal between Tucson and El Paso, an informal community is growing out of amateur astronomers building homes and observatories, in search of dark skies. 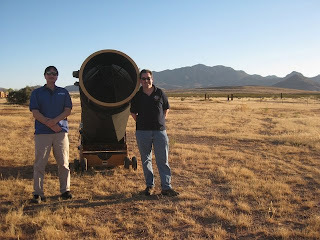 Astronomy magazine editors spent a few days at Arizona Sky Village and posted blogs, photos, and videos of their visit. There is also a 6 minute video tour of the development shot earlier this year. 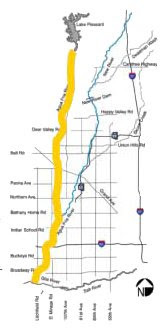 Plans for a 42-mile long West Valley Recreation Corridor [right] along the floodplains of the Agua Fria and New rivers are gaining support but losing resources to get the project in place by a July 2010 deadline. The Arizona Republic and Arizona Rock Products Association report that about 25% of the landowners, most of whom are sand and gravel companies, have committed to the project, but budget concerns in the companies and adjoining cities are raising concerns about whether they can take the next full steps. Rusty Bowers, government affairs director for ARPA, says the companies can fund a smaller study. The corridor would go through or along the cities of Avondale, El Mirage, Surprise, Glendale, Youngtown, Peoria, and Phoenix. Our webmaster Dominique Villela, set up an interactive page today showing the newly acquired network of broadband seismometers for Arizona. A partnership of AZGS, ASU, NAU, and UA is taking control of 8 of the 58 stations installed by EarthScope as part of the USArray deployment. The stations were here for two years, but are being moved out as the network rolls eastward. Our team of seismologists from the four institutions chose stations that fill gaps in monitoring seismicity, have proven to be high quality recording sites, and where the landowners agreed to permanent installations. EarthScope will continue to record, process, and store the data from the Arizona network. 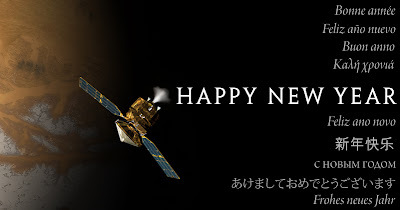 The new web page offers links to the EarthScope sites for each station. The network is expected to provide substantial new information about earthquake hazards in Arizona plus an enhanced capacity to understand the crust under the state as teleseisms from major quakes around the world pass through the area. A M4.5 earthquake occurred 7 miles southwest of Mexicali, Mexico Saturday night and produced minor shaking intensity in Yuma, Arizona. According to the USGS map, the event appears to be near or along a transform fault that is part of the rifting system that is opening the Gulf of California. There have been small to moderate quakes in the area for the past year with magnitude 5.4 event last February and a 5.0 quake in November. There are no reports of damage from Saturday's quake. Historic Gandolfo Theater in Yuma is damaged by 5.4 magnitude event on 11 Feb 2008. 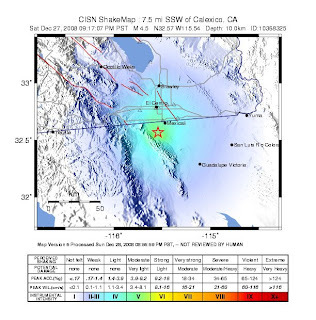 Yuma rocked by a second 5.0 magnitude that same day. Arizona is the #1 non-fuel minerals mining state in the nation for the 3rd year in a row, largely due to value of copper production. The governor’s proposed merger of the Arizona Geological Survey and the Arizona Dept. of Mines and Mineral Resources is defeated by a legislative committee. An Easter weekend landslide closes Beeline Highway (SR 87) near Payson for six days -- continued movement through December. UofA provides first ever university leadership role for a planetary mission with the Phoenix Mars Lander. The Phoenix mission produces new insights into role of H2O on Mars and sets a new standard for communicating science and engaging the public in America and around the world. AZGS and the 3 public universities receive nearly $500K from FEMA to construct a broadband seismic network in Arizona for monitoring seismicity and evaluating real seismic risk that should lead to better hazard mitigation. Geology graduates get starting salary offers of $80K per year, rising to $100K as the demands from resource companies heat up. Resolution Copper announces a $652 million assessment of the proposed mine near Superior. Riding the metals rollercoaster -- copper (metals) industry sees record highs -- over $4.00 USD per lb in July – to lows – about $1.30 per lb as the year closes. Mining plans are shelved or cancelled, hundreds of miners are laid off. Sterlite tops Grupo Mexico’s bid to take over bankrupt Asarco, but drops out as copper prices drop, but reportedly is working on a lower price offer. The first resource assessment of the potash deposit near Holbrook Arizona finds as much as 2.2 billion tons in place, an increase in total U.S. resources by about one-third. Depending on mining methods, the tenfold increase in potash prices puts a value on the deposit of perhaps more than a trillion dollars. High-resolution earth fissure maps were released for Apache Junction, Chandler Heights, Toltec Buttes, Mesa, Scottsdale, Pete’s Corner and Luke (near Luke Air Force Base). 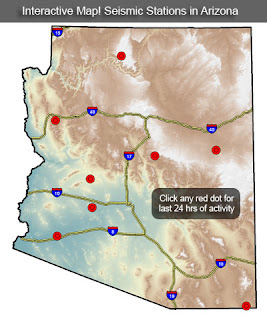 Arizona Dept of Real Estate hosts interactive IMS for earth fissure maps. The Museum of Northern Arizona therizinosaur dinosaur exhibit opens to rave reviews. Maps show extensive Recent and historic debris flow deposits for 15 canyons in the Santa Catalina Mountains foothills, many with homes on or adjacent to the flow deposits. Speculation abounds as to the impact of climate change on recurrence patterns of moderate-volume debris flows in south-central and southern Arizona. A newly discovered and widely reported “dinosaur dance floor” is re-examined as maybe just some unusual potholes. 12 July flood in Nogales, Sonora blamed on border wall. Damages run to $8 million. Renewed interest in uranium deposits in breccia pipes across northern Arizona led to a national battle between Congress and the Department of Interior over authority to limit exploration and mining near the Grand Canyon. Havasu Falls – 16 August flood damages water falls and hiking trails in Cataract and Havasu canyons. No injuries but repairs estimated at over $2.0 million. Interest grew in geothermal resources culminating in a new Western US plan for leasing on public lands, although some of the most prospective lands in Arizona are left out. USGS reports more than 100 naturally occurring deposits of asbestos in Arizona. Climate modeling indicates the desert southwest will be particularly hard hit by global warming, with longer droughts and more extremes in rainfall. Residents near the Agua Fria River in the Phoenix valley fear that sand and gravel mining are the cause of health problems in senior citizen communities. Noteworthy books of the year: Ancient Landscapes of the Colorado Plateau, by Ron Blakey (Northern Arizona University) and Wayne Ranney, provides a visual history of the evolution of the Colorado Plateau from the Proterozoic to the Present. Ken Hamblin's magnificent new book, Anatomy of the Grand Canyon: Panoramas of the Canyon's Geology offers spectacular photos with exquisite geologic explanations. The massive ancient Marcus landslide was documented near Scottsdale. Science Foundation of Arizona and mining companies unveil a plan to provide $17 million dollars to fund the Institute for Mineral Resources at the University of Arizona. A newly proposed “old age” for the Grand Canyon (about 17 Ma) receives tremendous news media attention but the interpretation is shot down from a variety of “old hands” in Canyon studies. Arizona State University joins NASA’s Astrobiology Institute and starts work on to guide the search for life by characterizing life’s elemental requirements. AZGS & BLM open Explore Arizona store/information center to meet needs of public for public lands info and to host a site in PHX that provides scientific reports, maps, and bulletins to government, business and industry. Efforts to reconcile opponents over the proposed Rosemont copper mine in the Santa Rita Mountains south of Tucson, hit a wall when the Institute for Environmental Conflict Resolution backed out of a mediation role, citing intractable positions by participants. Parts of the Santa Cruz River are declared navigable because of effluent releases. Permitting for the proposed Davidson Canyon limestone quarry in Pima County took numerous twists and turns as various government agencies took surprising actions one after another. The Arizona Geological Society celebrates its 60th anniversary. Water is an issue every day. Business Week calculates that the State of Arizona has the biggest budget shortfall in the nation, at $3.1 billion, or 30.8% of the FY09 budget. The state started the fiscal year in July with a $1.9 billion gap which continues to widen. 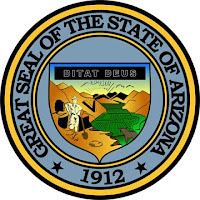 AZGS took a 5% reduction of state general funds in July and has been instructed to cut expenditures in anticipation of the Legislature taking action after they convene in mid-January. Other agencies took similar cuts and some have had program funds swept up for use elsewhere. 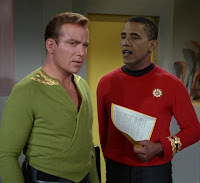 My colleague, Dan Sarewitz, at Arizona State University, is quoted in an AP story as saying calling Obama a geek is unfair both to the president-elect and geeks. "He's too cool to be a geek; he's a decent basketball player; he knows how to dance; he dresses well. It's too high a standard for geeks to possibly live up to." But Alan Leshner, head of the American Association for the Advancement of Science, in answering the question, Is Obama a Geek? probably speaks for many of us when he says "I hope so." Submit comments by 14 November 2008 to Richard Berg berg@isgs.uiuc.edu. 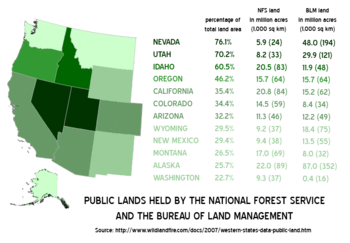 In the Western states where 25-75% of the lands are managed by federal agencies, the Secretary of Interior is often seen as more powerful than governors. So, the appointment of Ken Salazar is a bigger deal for the region than you might gather from the national news media. But the New York Times ran a nice piece last week that I just read that helps lay out the tone and scale of the debate. The National Mining Association is quoted as saying Salazar is "open-minded and can see at least two sides of an issue," and petroleum groups say he understands that an energy solution for the nation includes production from public lands. This morning's Charlotte Observer published an interactive overview of all the Cabinet nominees, and they summarized Ken Salazar as "respected in Colorado by politicians of both parties for his measured approach and is praised as honest, particularly by environmentalists, but also business interests." Mr. Salazar will have his hands full, balancing the laws that allow recreation and exploration and development of natural resources on public lands with growing demands and perceptions that public lands are off-limits and inherently wild.